I love decorating my home for the seasons…I also love changing things up and creating simple vignettes around my home. 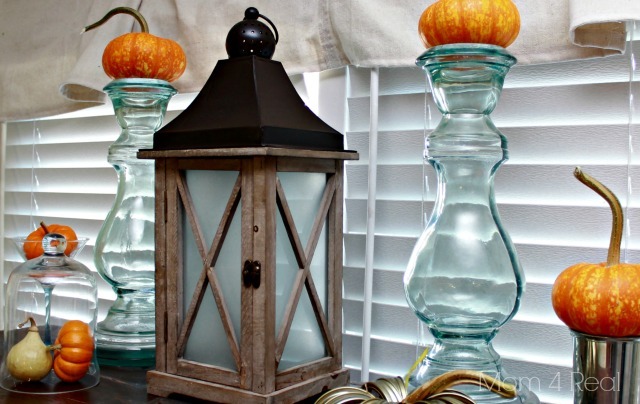 Today I’m going to show you a few of my Fall vignettes. I believe that your home should totally reflect the family that lives there, and my family is all about fun and simple. I am not expert, so this advice simply comes from what I do to add character and a Fall feel to each room during the Fall season. I always start with my mantel…the kitchen is the heart of our home, but the mantel is the focal point. It’s the first thing you notice when you enter our home, and can be seen from the kitchen as well. For the past year, the chalkboard has been living on my mantel. I usually decorate around it, then finish off with a fun little drawing. I started with painted white shutters on each side, then placed glass vases in front of each of them and added some twigs from my tree to them. 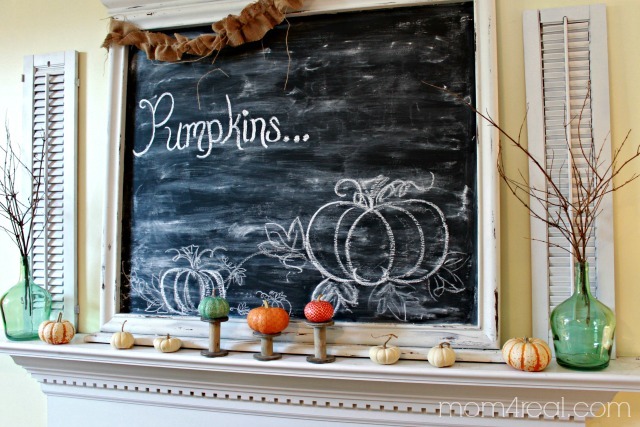 I added some white pumpkins and my favorite wooden spools, then drew a few pumpkins on my chalkboard to finish it off! 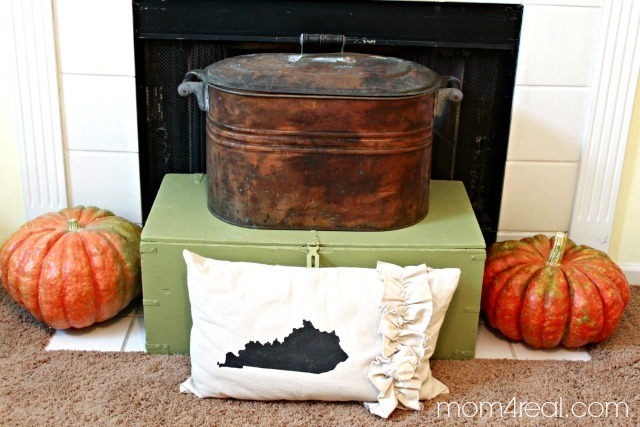 I stacked a trunk and copper broiler in front of my mantel, and added my Kentucky silhouette pillow along with a couple of large heirloom pumpkins. When it’s time for Christmas, the fireplace screen will replace all of this so we can use it for fires…I’m sure I’ll be adding lots of holiday decor then…I can’t wait! On the other side of my living room I created a small vignette using a clear glass lamp that I filled with potpourri and a few mini pumpkins…I think it’s a super fun, but unexpected touch! In the dining room, I created a vignette on top of my china cabinet. I just used what I had already and added some miniature pumpkins to different spots. 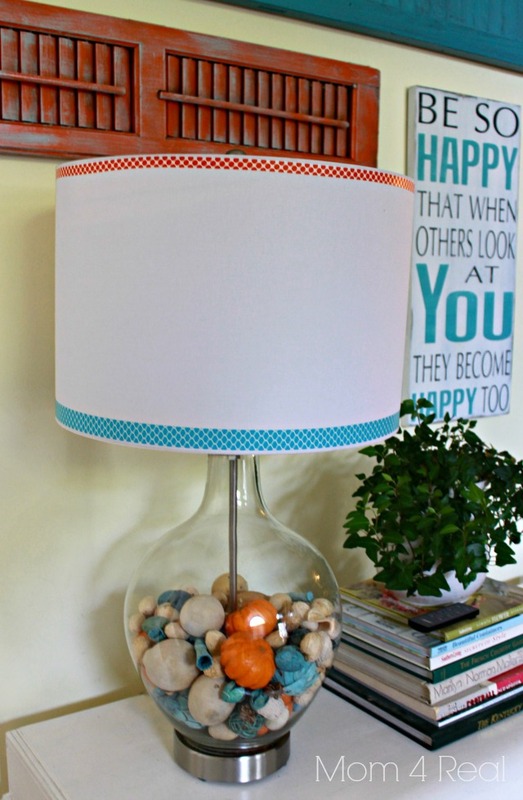 This vignette is beyond simple, but one of my favorites! 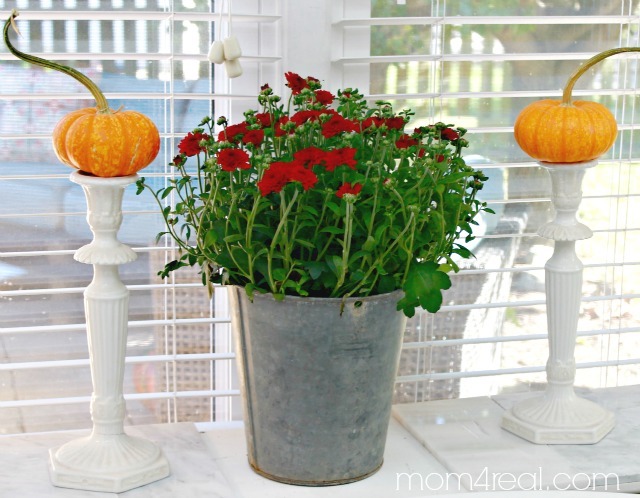 It’s just a mum in a sap bucket flanked by two white candlesticks with little pumpkins on top of them. My advice is to grab things from different places in your home and have fun. You can add a few Fall touches to the things you already have and still change the feel of your home. Also…it never hurts to burn a candle…my favorite is Pumpkin Spice from Yankee Candles…it smells like pumpkin pie everyday! Some of my favorite and crazy talented blog friends are sharing their vignettes and advice for creating them as well…you will be floored by their creativity! Pumpkin spice is one of my all time favs too! I hope they never discontinue it! Happy Fall my sweet Kentucky friend! Love the mini pumpkins on the candlesticks!! So cute! I love your mantel Jessica! I’m crushing on chalkboards this fall. So cute! Thanks for sharing your vignettes! It’s so fun to see how everyone style fits their personality – your’s are so you and love each and every one!!! So pretty & Fun Jessica! 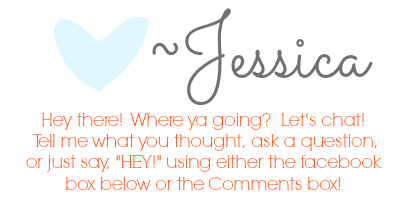 love the colors that you used Jessica!